CHE was a policeman until the fateful night he was shot. He and his drinking buddies had decided to play "Russian Roulette," a deadly game where men point a six-shooter pistol with just one bullet in it at each other's head, pull the trigger, and see who gets shot first! Che lost. The bullet left him paralyzed on the left side of his body (hemiplegic). Luckily, Che's mind and speech were unaffected. He was given a standard wheelchair. But with the use of only one arm, he needed assistance to go anywhere. Che spent months at PROJIMO for rehabilitation and to learn new skills. A commercial one-arm-drive wheelchair from the United States had been donated to the program. Che loved it, and tried to go everywhere in it. But it kept breaking down. Commercial one-arm-drive wheelchairs always break. Factory-made hemiplegic (one-arm-drive) wheelchairs are very expensive and seldom seen in poor countries. They have design problems which limit their usefulness. They are built for smooth hospital floors, not village paths. On rough terrain, they repeatedly break - and are hard and costly to fix. This commercial design is nothing like Osvaldo's one-arm-drive chair made at PROJIMO (see page 249). In the commercial chair, the rider delivers power to both rear wheels with one hand. The two hand-rims, one next to and slightly smaller than the other, are mounted on one side of the chair. One rim is fixed to the wheel on that side. The other is connected by a central axle (transverse rod) to the opposite wheel. 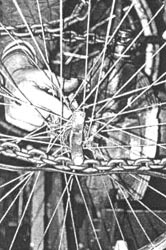 To move straight ahead, the rider grips both hand-rims at once. To make a turn, he pushes just one hand-rim. The weakness of the commercial chair is that the axle that transfers power from one side to the other is too thin. It passes (on ball bearings) through the center of the wheel hub on the near side, and is welded to the hub on the far side. Unfortunately, the axle cannot be replaced by a thicker, stronger one because of the small hub-hole it goes through. When modestly stressed, the fragile axle breaks. Need for a Rugged, Low-Cost, One-Hand-Drive Wheelchair. PROJIMO sees a lot of persons who need a one-hand-drive wheelchair. These include folks who have had a stroke or suffered a head injury (like Che), and children with "hemiplegic" cerebral palsy. 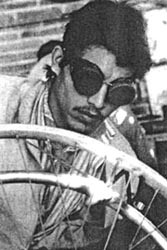 Osvaldo's chair with front-wheel steering allowed him to move about town independently and helped him to recover self-direction and the will to live. The design was simple, low cost, and fairly easy to make, But that chair had one big disadvantage. Like hand-driven tricycles, it took up a lot of space. Indoors, it was cumbersome. There was a need for a one-arm chair that was cheap, road-worthy, and compact. 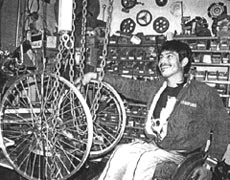 MARTÍN, the paraplegic wheelchair builder whose gurney is featured in Chapter 37, was aware of the need for a reliable, one-arm-drive wheelchair. Time and again, he had welded and tried to strengthen the weak axle of Che's commercial chair. He also realized that, if the power-transfer mechanism broke while the rider was climbing a steep ramp or trail, it could be dangerous. 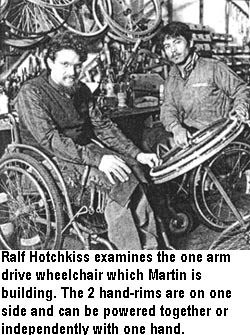 During Martín's visit to California, while recovering from surgery, he stayed in the home of wheel-chair designer, Ralf Hotchkiss. When Ralf was away teaching, Martín used Ralf's workshop, which is beautifully adapted for working from a wheelchair (see page 195). One day, Martín began to design and build a one-arm-drive wheelchair that would be compact and low-cost, yet strong. In building the wheelchair frame, Martín followed Ralf's basic Whirlwind design. For the one-arm-drive mechanism, he used features from the commercial design, but with a much thicker and stronger transverse rod (axle) to transfer power from a hand-rim on one side of the chair to the wheel on the far side. Testing the strength of the new mechanism. When the chair was done, Martín and Ralf tested the strength of the one-arm-drive mechanism. They hooked a spring scale to the far wheel, and with a block-and-tackle put increasing force on the hand-rim that powered it. To their joy, Martín's heavy-duty axle-rod withstood over 200 pounds of force before it broke. This is much stronger than the commercial hemiplegic system (which breaks at about 30 pounds of force).